Last week, I was lucky enough to attend BlogWorld in Las Vegas. Overall, the event was a blast. I met a ton of fantastic bloggers, drank a lot of great scotch (courtesy of McCallan), and sang Karaoke with a live band in front of hundreds of people. 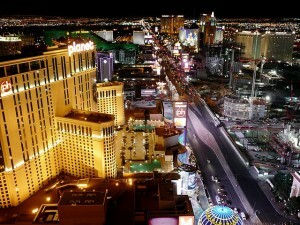 I even got to enjoy a free helicopter ride across Vegas (courtesy of Infolinks). They picked us up in a champagne filled limo. Not bad; seems like being a blogger is already paying off =). Make Friends With Influencers: A good strategy at conferences is to make friends with a few influential people and then have them introduce you to everyone else. For me, those people were Srinivas Rao at BlogCastFM and Chris Ducker at Virtual Business Lifestyle. Both of them were amazingly helpful in plugging me into the blogging community. Be Active On Twitter: Up till now, I never really took Twitter seriously, but now I realize just how powerful it is. Throughout the conference, I was tweeting people to find out where they were and what afterparties were going on. I also learnt that you often get a better response out of Twitter than e-mail when trying to connect with someone in new media, so that will be my strategy going forward. Have Deep Conversations With Smart People: On Sunday, I was lucky enough to sit down with Sid Savara, a well-known blogger in the personal development space. Sid had some tremendous insights on how to generate more traffic for my blog and also improve sales within my online marketing business. We must have talked for 3-4 hours, and I really got a lot out of it. I'll probably write up a post in the future about these specifics. Most Sessions Are Meaningless: While there were a few good speakers (including Jonathan Fields), most people didn't really put a whole lot of effort into their talks. As a result, a lot of the content was fairly general and unhelpful. I quickly realized that my time was better spent networking with influencers around the conference hall. Conferences make a LOT of money: At one of the afterparties, I was talking to a lady who organizes conferences for a living. I found the economics to be very interesting! Evidently, sponsors pay for all of the expenses, so ticket sales are basically pure profit. Blogworld is a smaller conference, but some of the big ones can net the organizers many millions of dollars. Link To Cool People: I met a ton of cool people, and the best way to stay on their radar is by linking to them frequently. This lets them know that you value their content. In fact, I'm going to do it right now: here are some of the coolest people I met. How have you gotten value out of conferences/networking events? Please share in the comments. Categorized under: Marketing, Personal Branding. Hey Vik, it was great to meet you in Vegas. I went to some poor sessions and some good sessions so as you say, it was a toss-up. Great list of cool people. Sid is definitely awesome. Thanks for the comment! Your blog is great as well!